We have no signs of a cria from Nessa yet. Time will tell. We are on Day 15 of Llama Watch, Round 1. This is so different than watching and waiting for ewes to drop their lambs. We have one week before the first lambs are due; our barnyard is stuffed with groaning, waddling ewes. Well, I imagine they are groaning...they certainly are waddling! It brings to mind a "home for unwed mothers," as they used to say. The girls seem to be a bit testy with each other; there has been a bit more head butting between the ewes. As I wait for lambs, I invent stories about the ewes... Perhaps head butting is their way of taking out their frustration and jealousy over "their ram." It's barnyard trash-talk... . I put together three breeding groups, with expected lambs from the end of April through the end of May. Since I put the groups together, doesn't that make me the Madame? The Sheep Madame. Yes, every breeding season, you may call me Madame Shepherdess. The first breeding group was put with Bluefaced Leicester ram Beechtree Dougal. We purchased him from Becky Utecht last November. He has a lustrous, purly fleece which is just luscious!! My goal with Dougal is to add his fleece qualities to our flock as well as more size for market lambs. He was put over four Shetland and two North Country Cheviot ewes. 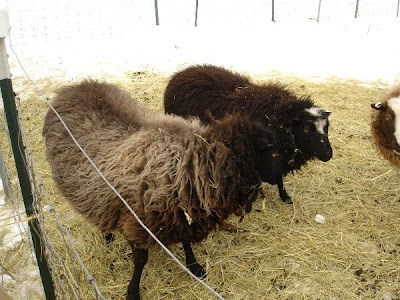 By putting a BFL over these girls we will get first generation crosses which are commonly done in the United Kingdom. 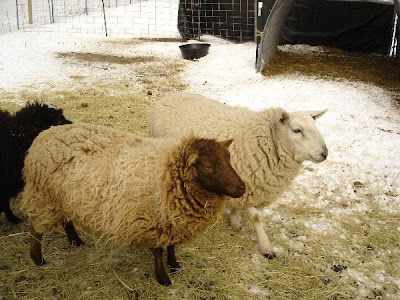 The crossbred Mules, as they are called, can then be put to a terminal sire ram for a larger market lamb. I'm not sure that we will add the terminal sire to the mix next year. I want to see how we do with lamb size this fall. We will hopefully get at least a few Mule ewes to retain, and the rams which aren't whethered for fiber pets will be a nicer size market lamb. All these ewes appear to be pregnant; right now it looks like one of the Cheviot ewes and Roundaboutacres Bunny will be the first to lamb. Our two NC Cheviot ewes, #7 and #23. Bella is in the back. I really like the Cheviots ewes. They are larger but calm and mellow with the other ewes. I still haven't named them! I want a theme for the NC Cheviots - constellations, flowers, jewels, etc. Any suggestions?? Little Red Oak Lily (moorit) in front and one of the Cheviot ewes in the back. 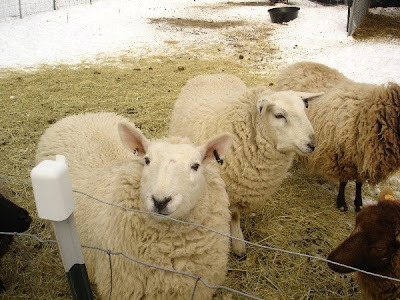 In this picture Lily is about 18 months old and the Cheviot is about six months. The Cheviots are definitely larger and blockier than the Shetlands. And their fleece is dense, dense, dense! In the next post I will have pictures of the other two breeding groups. In the meantime, I am looking forward to more barnyard trash-talk! Oh I loved seeing the photos of your sheep. I've missed Dougal of course, especially at shearing time. Those Cheviots look great. I can't wait to hear about the arrival of your first Mule lambs. It won't be long now. I never thought about my mother as a Lady Pimp before. Thanks for that, Mom. Really.